Being a reputed company in the business, we export and supply Poxet 30mg Tablets that finds a vast usage for treating male health problems. The offered drug is massively popular for its high effectiveness and long shelf life. 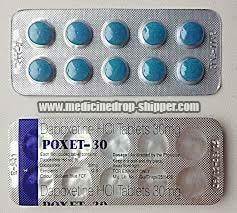 Poxet 30 mg is provided in a tamper-proof packaging, to protect these tablets from moisture and contaminants. We thoroughly examine them against various quality parameters before forwarding them to our clients. Clients can avail them at a reasonable price.